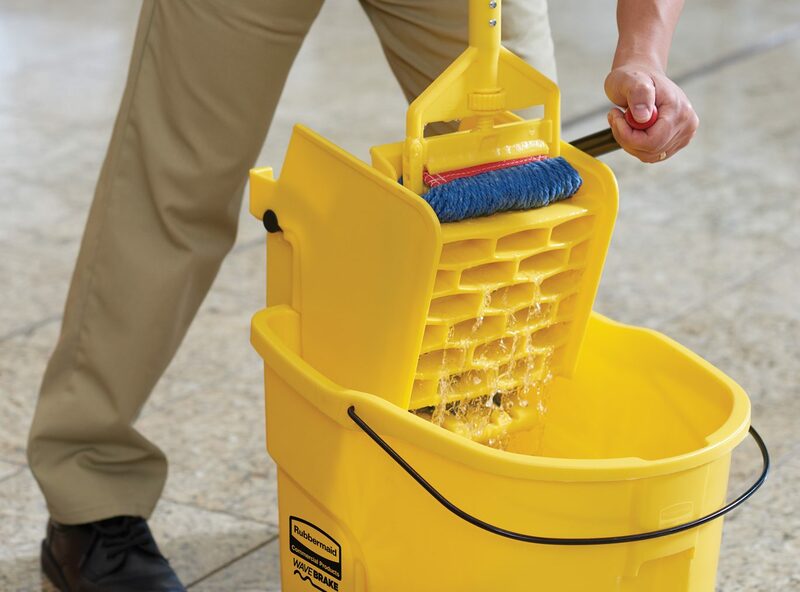 by Brianna Crandall — December 7, 2018 — Rubbermaid Commercial Products (RCP), provider of innovative, solutions-based commercial products, announced three new or updated mopping products designed to help facilities and janitorial staff clean floors more safely and effectively. The two wet mops and mop bucket and wringer were introduced at the ISSA/INTERCLEAN Show. RCP cites a Bureau of Labor Statistics (BLS) study that found that 20 percent of all job-related injuries are caused by slips, trips and fall injuries. The New Generation WaveBrake’s patented baffles are engineered to result in 80 percent less splashing while mopping and maneuvering, helping to create a safer environment for patrons and staff. Additionally, the average mop bucket with water weighs up to 28 pounds. The New Generation WaveBrake’s optional foot-operated drain helps users empty mop buckets into floor drains, eliminating the strain associated with lifting and bending. For facilities where sinks are used, integrated handles, a sink ledge and a pour spout provide control while lifting and emptying. The New Generation WaveBrake is designed and built to a high standard for professional use. With an exemplary warranty, the WaveBrake side-press and down-press wringers are guaranteed to last five years or 200,000 wringing cycles (based on internal side-press testing). A durable wringer handle with a comfort grip, non-marking casters, and an optional dirty water bucket are intended to help improve worker productivity. The previous version of the WaveBrake will be discontinued and replaced with this new version. The New Generation WaveBrake is available in 26-quart, 35-quart and 44-quart sizes, with a side-press or down-press wringer. A variety of colors are available to accommodate a color-coded cleaning system and help reduce cross-contamination. The new Scrubbing Wet Mop features an integrated scrubbing headband designed to remove stuck-on messes faster without interrupting the mopping process. 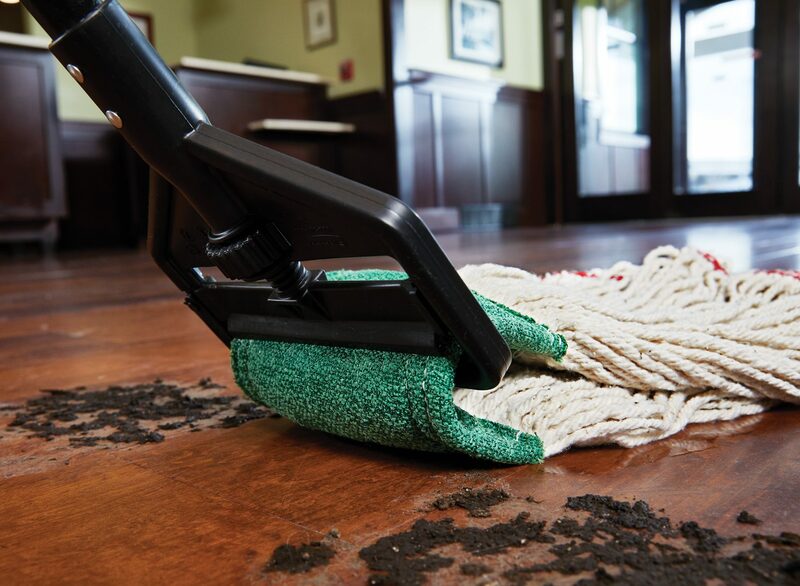 RCP notes that traditional wet mops are reliable cleaning tools, but picking up stuck-on debris often requires a separate tool and interrupts the cleaning routine, which impacts worker productivity. The Scrubbing Wet Mop’s integrated scrubbing headband allows the user to have two tools in one and removes stuck-on debris two times faster than a traditional RCP wet mop. As part of our field research, we recognized that when stuck-on messes needed to be cleaned off the floor, users were adding scrubbing pads to their mops, which proved to be inefficient and not reliable, or were stopping their work to get another tool. The new Scrubbing Wet Mop meets the needs of users by providing an easy-to-use, efficient and productive 2-in-1 tool for everyday mopping. The Scrubbing Wet Mop’s scrubbing headband is universal and compatible with side-loading Invader and clamp-style Gripper handles. It is double-sided and securely sewn-in, lasting the lifetime of the mop. Additionally, it is designed for effective scrubbing without scratching on a variety of floor types, including laminate, linoleum, vinyl, and light and dark hardwood. 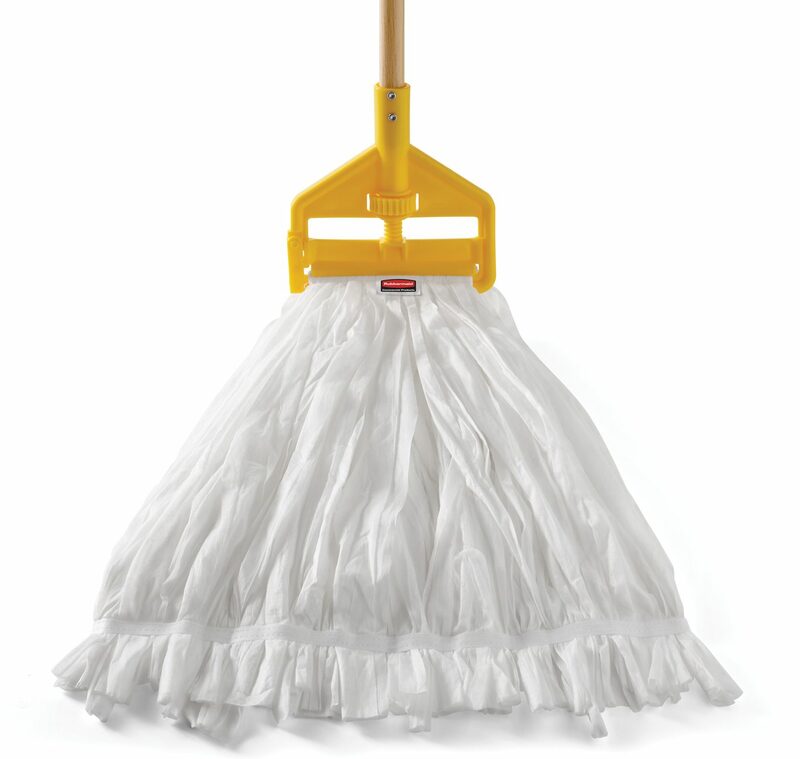 The Scrubbing Wet Mop is available in launderable and non-launderable mops in a variety of sizes and colors. The new Disposable Mop helps workers remove three times more dirt and grease than a traditional RCP economy cotton mop, resulting in cleaner floors, says the company. Constructed of 99 percent recycled non-woven material, the RCP Disposable Mop is designed for a one-shift use to deliver a consistent clean in demanding commercial environments. The new Disposable Mop contributes to increased worker productivity, achieving a better clean, and is designed to last an entire shift. Additionally, the Disposable Mop does not require a break-in period, allowing immediate peak performance to help employees work faster. RCP found that users commonly reuse — and often over-use — traditional cotton mops, which can lead to the spread of dirt, grease and grime. The new Disposable Mop is made to be disposed of after one use to avoid reuse of contaminated mops. This not only reduces cross-contamination, but it also keeps patrons from seeing dirty mops in the facility. This is a crucial point for a successful facility, as 90 percent of Americans cite cleanliness as a key factor for repeat visits to a business, according to an IPSOS 2017 Online Survey cited by RCP. The new Disposable Mop is available in #16, #20, #24 and #32 sizes, with 1” and 5” headbands to accommodate standard mop handles, including the Invader and Gripper handles. All mops include a tailband for improved spread and floor coverage vs. traditional mops, resulting in cleaner floors. For more information, click on the product links above or visit the Rubbermaid Commercial Products website. With the summer travel season upon us, pest control pros say to watch out for bed bugs, even in office buildings June 8, 2018 In "Surveys and Trends"
Need to sanitize sensitive equipment and electronics? City Wide Maintenance now offers electrostatic disinfectant services December 5, 2018 In "Products and Services » Services"
Don’t have 10 minutes to let your disinfectant work? This one claims a 5-minute kill time for a variety of surfaces March 1, 2019 In "Products and Services » Cleaning Equipment & Supplies"
Your cleaning is only as good as your checklist — see what this healthcare study found June 20, 2018 In "Surveys and Trends"
Do visitors worry about germs on the check-in touchscreen in your public areas? This new self-cleaning film works to keep it disinfected June 6, 2018 In "Products and Services » Cleaning Equipment & Supplies"